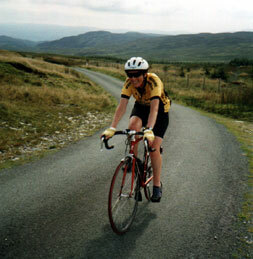 The Wild Wales Challenge has been held every year since 1984. It is organised by the Merseyside D.A. of the C.T.C. Rob Sharpe, one of our more recent recruits, has been a regular participant and coerced 5 fellow 'Chesh' members into joining him for the 2001 event. The ride starts and finishes in Bala and, as an early Sunday start was called for, it was suggested that we travel down to the area on Saturday morning and have a 'warm up' ride in the afternoon. We arranged to meet at our lodgings, the Berwyn Arms (on the Llangollen to Corwen road), at 12.00 hrs. Fred Potter followed myself and Pam from Marple and just before Llangollen Rob Sharpe joined the convoy. We arrived at about 11.45 and shortly after were joined by Pete Levene and Bob Grainger. We transferred our gear into our rooms and set off to explore the quieter lanes in the area, lunching in Corwen and taking afternoon tea in Llangollen. That evening we dined in the 'hotel' and enjoyed a steady flow of beer and jokes! We negotiated an early breakfast and, after a final nightcap at the Sun Inn, retired for the night. The accomodation was a little basic - perhaps what you may expect from a 2 star bunk house - Fred, Rob, Bob and Pete all sharing one room - and Bob having to use the top bunk. With a good breakfast inside we set off in convoy for Bala, about 15 miles away. After 'checking in' at the headquarters, we had a cup of tea and set off together towards Trawsfynydd. The route started gently enough, following the south side of the lake before taking the Trawsfynydd mountain road to the first checkpoint at 20.6 miles. 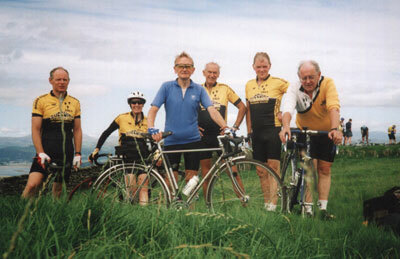 Pam reaching the top of the first big climb before joining Rob Sharpe, Bob Grainger, Fred Potter, Phil Fern & Pete Levene for the 'team' photo. The next official checkpoint was Harlech, but a secret control was put in a loop out to Cwm Bwychan to make sure no-one cheated. We managed to get something to eat in a cafe in Harlech - just before they ran out of food and closed! This leg had been very, very hard, but the views down to Tremadoc Bay were magnificent. After leaving Harlech (49.1 miles) we left the main road for another major climb and descent to cross the same main road - the opportunity to miss out the climb was too tempting for some as as we approached the crossroads we saw a group of wimps approaching along the main road! We were soon climbing again towards the next checkpoint at Ffestiniog at 65.4 miles. There was now only one leg to go of about 17 miles and victory was in sight! Rob had disappeared up the hill and I insisted Bob & Fred pressed on whilst I waited for Pam. We finally rode back into Bala at 19:30 - 10 hours and 82 miles later - tired, but well satisfied with our ride. A commemorative slate plaque and a ploughmans were our rewards. I, for one, hope to be there next year.